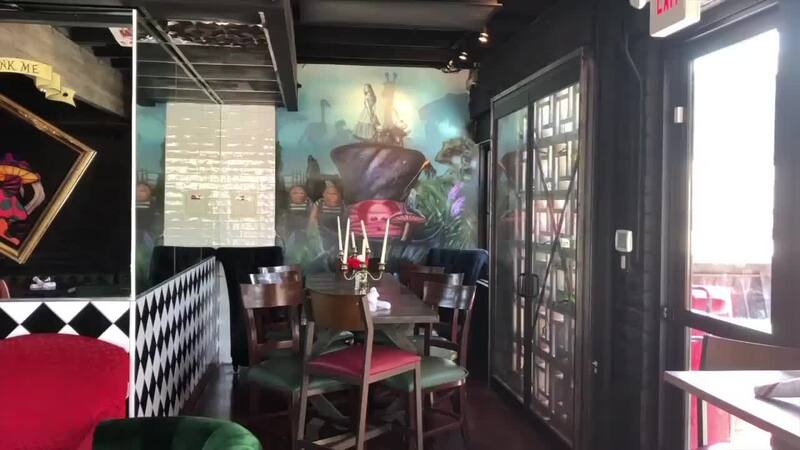 A whimsical cocktail lounge themed after "Alice in Wonderland" has opened its doors in Phoenix. Here is our first look inside. PHOENIX — A whimsical cocktail lounge themed after "Alice in Wonderland" has opened its doors in Phoenix. Hatter and Hare (formerly called "The Rabbit Hole") opened last weekend in the former "Joe's Midnight Run" building near 7th Street and Bethany Home Road. "We're all mad here" is written on the overhang while a mural featuring Alice, the White Rabbit and his watch, along with the Mad Hatter's purple hat is painted on the side of the building. Bright red and green couches and uniquely-shaped orange chairs fill the lounge. Large playing cards bow from the ceiling, as a backwards counting clock hides in the corner. There is a mirrored wall with empty picture frames and "Drink Me" and "Eat Me" signs on it. It's the newest concept from Glass Half Full Hospitality, the restaurant group behind Old Town Gringos and Camp Social, the camp-themed restaurant next door to Hatter and Hare. They share a parking lot. Signature cocktails include "Wonderland," "Cheshire Cat," "Jabberwocky" and "Queen of Heart." They've also themed a few classics: "Side Cat," "The Looking Glass Negroni," and "French 10/6." Some group-sized cocktails are served in full tea sets or bucket-sized teacups. Like Joe's Midnight Run, the kitchen will remain open late — until 1:45 a.m., Tuesday - Sunday. The bar opens at 4 p.m. and is closed on Monday. 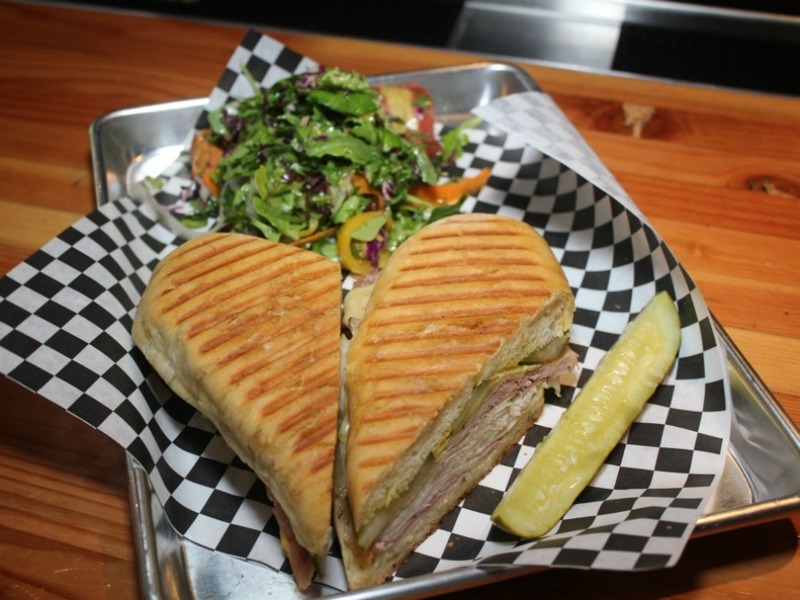 The menu includes a mix of bar snacks, salads and toasted sandwiches, conveniently cut and shaped to look like a heart. Their signature appetizer is The Gryphon: almond mole, burrata cheese and strawberry chutney with toasted bread. Other appetizers include olives, a meat and cheese board ("The Queen's Platter"), and roasted carrots ("Karrots"). The patio has an oversized pink tufted couch with a cake slice-shaped ottoman in the middle. 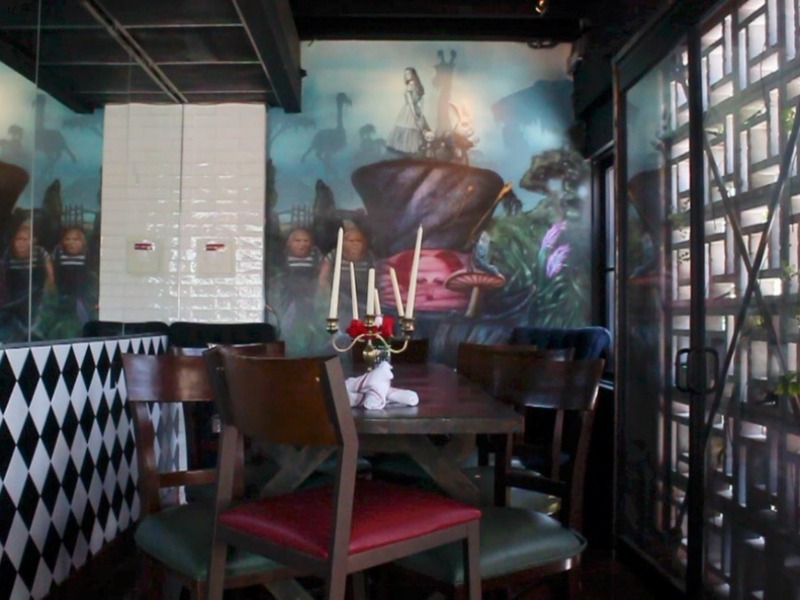 There are high-tops and tables, a couple of booths, and a green accent wall draped in vines and red and white roses.